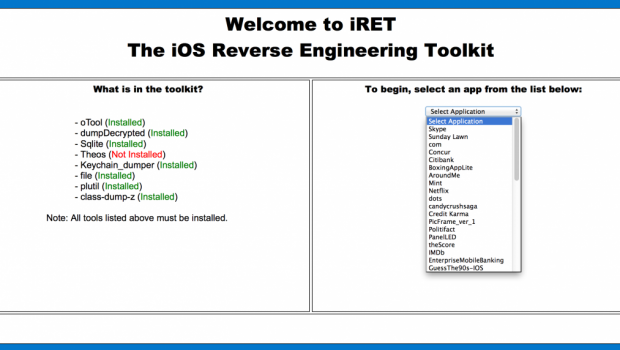 The iOS Reverse Engineering Toolkit is a toolkit designed to automate many of the common tasks associated with iOS penetration testing. 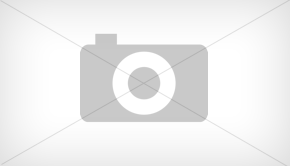 Reading database content using sqlite. Reading log and plist files. Dumping binary headers using class_dump_z. Creating, editing, installing theos tweaks. Installation: You can download the files and build the debian package yourself or you can simply install the iRET.deb package onto any jailbroken device using dpkg -i on the command line or by using iFile, which is available from Cydia. After it is installed, respiring the device and you should see a new “iRET” icon on the device. Usage: Must be connected to a wireless network. Launch the application, click the “Start” button. It will then show the ip address and port number you should navigate to on your computer (computer must be connected to same wireless network as device). On first run, it will take a bit of time for the iRET tool to identify all of the required tools. Thanks to Steve Jensen, for sharing this tool with us.